AMERICAN BLUES THEATER CELEBRATES THE SEASON WITH SPECIAL EVENTS AND ITS 100th PERFORMANCE OF IT’S A WONDERFUL LIFE: LIVE AT THE BIOGRAPH! WITH WONDERFUL LIFE FOREMOST COLLECTOR RICHARD GOODSON SUNDAY, DEC. 9 AT 2:30 P.M.
American Blues Theater (ABT), Chicago’s second oldest Equity ensemble, is proud to announce a special festivities in conjunction with their production of It’s a Wonderful Life: Live at the Biograph!, directed by Marty Higginbotham, at the Victory Gardens Biograph Theater, 2433 N. Lincoln Ave., Sunday, Dec. 9 at 2:30 p.m. Tickets are $19-$49 to the performance and no additional charge for the celebration. Tickets may be purchased through the box office (773) 871-3000 or online at americanbluestheater.com. Every performance is a party! · Sing alongs with Michael Mahler and Dara Cameron. In addition to the post-show activities, all children, ages 12 years and younger, receive a keepsake from the production. 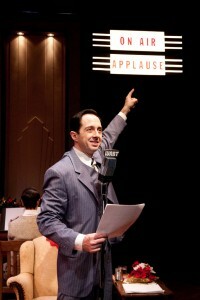 American Blues Theater welcomes Grayslake native, Richard Goodson, to the Biograph to display selections from his 4,000-piece collection of It’s a Wonderful Life collectables, the world’s largest collection of artifacts from the Holiday movie classic, for their 100th performance of their Biograph production. Goodson will also be available to meet with the audience and talk about his beloved collection from one of the most popular movies of all time. Goodson’s extensive and valuable collection is part of a day of celebrations marking this milestone. Immediately ffollowing the 2:30 p.m. production, the audience is invited to stay for a 100th performance party that includes, in addition to the post-performance events, every member of the audience takes home a collectible keepsake. At the production and during the meet and greet, Santa Claus makes an appearance and gives all children, ages 12 years and younger, a keepsake. It’s a Wonderful Life: Live at the Biograph!, directed by ABT Ensemble member Marty Higginbotham, November 23 – December 30 at Victory Gardens Biograph Theater, 2433 N. Lincoln Avenue. Pink Previews, where tickets sales benefit the Lynn Sage Foundation for breast cancer research are November 23 – 25. The press/opening night performance is Thursday, Nov. 29 at 7 p.m. Tickets are on sale for $19-$49 through the box office (773) 871-3000 or online at americanbluestheater.com. The performance schedule is Thursdays and Fridays at 8 p.m., Saturdays at 5 and 8 p.m. and Sundays at 2:30 p.m. The 100th performance of this Holiday tradition at the Biograph Theater is Sunday, Dec. 9 at 2:30 p.m. An additional holiday performance is scheduled for Wednesday Dec. 26 at 8 p.m. Valet parking is available for $12. For more information visit www.americanbluestheater.com. American Blues Theater presents the 15th Anniversary Production of It's a Wonderful Life: Live in Chicago!